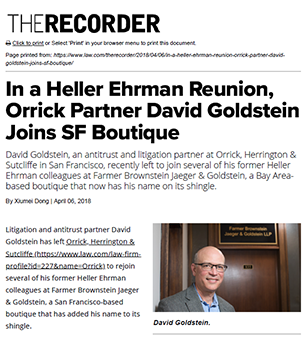 in San Francisco, recently left to join several of his former Heller Ehrman colleagues at Farmer Brownstein Jaeger & Goldstein, a Bay Area based boutique that now has his name on its shingle. 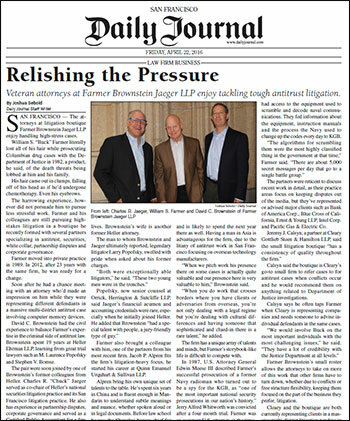 The veteran attorneys at Farmer Brownstein Jaeger LLP are immersed in the sometimes shadowy world of cartel antitrust litigation. 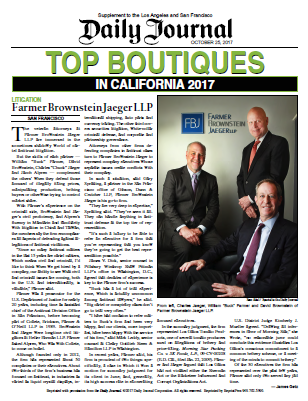 But the skills of each partner – William “Buck” Farmer, David Brownstein, and Charles “Chuck” Jaeger – complement the others’ when they defend those accused of illegally fixing prices, manipulating production, bribing buyers or otherwise trying to control market share. With Farmer’s expertise on the criminal side, and Brownstein and Jaeger’s civil proficiency, the members say the firm encompasses all aspects of defending against allegations of antitrust violations.